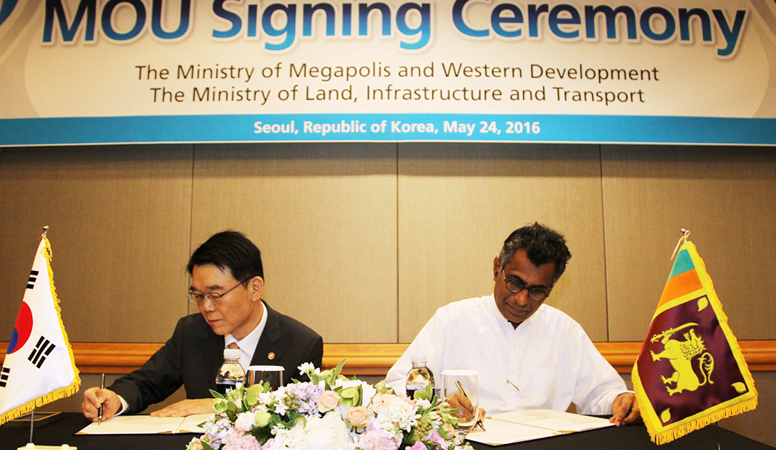 A major investment, infrastructure and development initiative is the Western Region Megapolis Planning Project (WRMPP) which hopes to develop the greater Colombo urban area in the Western province as a ‘megapolis’, with the project valued at USD 40 billion, to be implemented over a 15-year period, in an urban region with an 8.5 million population. 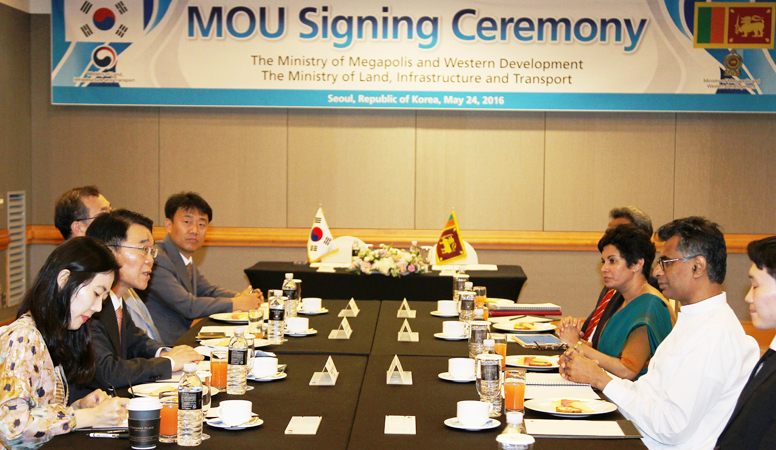 The Megapolis Plan has opened a new and important chapter of cooperation between Sri Lanka and the Republic of Korea. The Minister of Megapolis & Western Development of Sri Lanka Patali Champika Ranawaka met with the Minister of Land, Infrastructure and Transport (MOLIT) of the Republic of Korea Kang Ho-in on Tuesday 24 May in Seoul to discuss economic cooperation, including Korea’s specific engagement in the Western Region Megapolis development projects. The bilateral meeting was followed by the signing of a Memorandum of Understanding (MOU) by the two Ministers on collaboration between the two Ministries under the Western Region Megapolis Development Activities. The objective of this MOU is to formalise a framework of cooperation and to facilitate collaboration that can contribute towards mutual benefit, to successfully implement identified sections of the Western Region Megapolis project agreed to by the parties, and to undertake detailed planning, promote joint projects and foster cooperation according to main development plans, within the framework of the MOU. Cooperation for the Comprehensive Planning of (I) Science & Technology City, (II) Katunayake Aero City Katunayake is identified in the Megapolis Project Plan for Cooperation under the MOU. 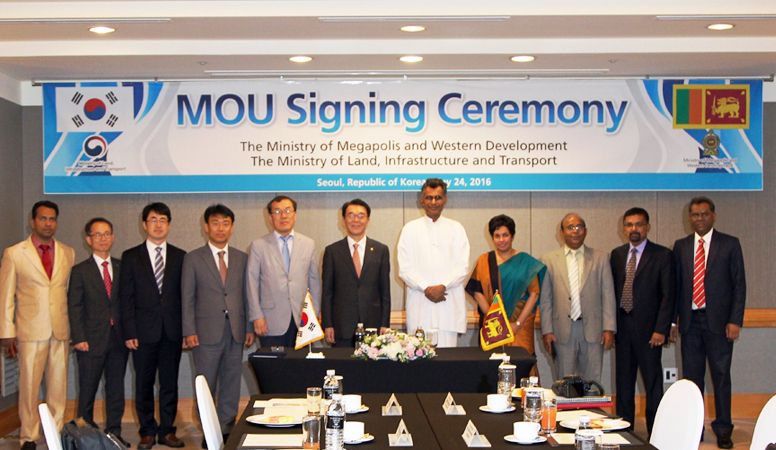 The Korea Land and Housing Corporation (LH) of the Republic of Korea and the Western Region Megapolis Planning Project of Sri Lanka, under the purview of the respective Ministries, shall be the implementing agencies for cooperation in the identified areas within the framework of the MOU signed between the Parties. Subsequent to signing the MOU in Seoul, a Presentation and a G2B session were organized providing detailed information on projects under the Megapolis Development Plan with the participation of around 15 reputed Korean companies. Presentations on different projects under the Megapolis Masterplan were made by senior officials of the Ministry of Megapolis and Western Development at the session. Over 150 development projects have been identified for implementation under the Magapolis Masterplan under 10 thematic areas. The latter includes transport, energy, waste management, Science and Technology, Smart City Development, Aero Maritime Trade Hub, etc. Project funding will be generated through private-public partnerships.